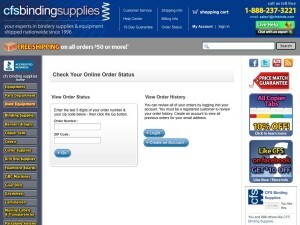 In the past, the most requested feature we get from repeat customers on www.cfsbinds.com is the ability to store billing and shipping addresses. 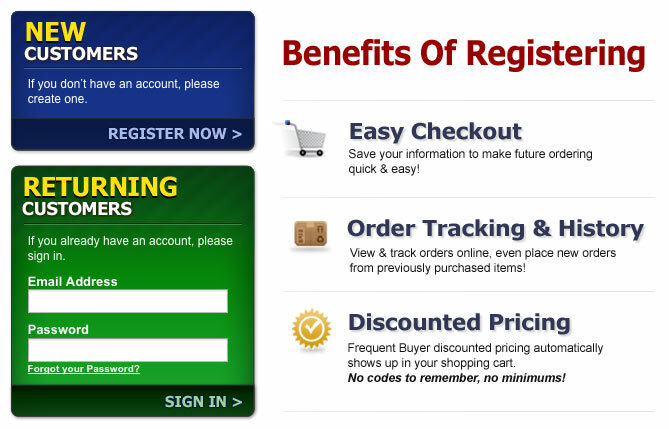 Back then the account registration feature offered by our e-commerce host is clunky and just does not meet our level of standards for what we want to offer our customers. Well, that’s all changed! It was September of 2013 when we went live with our new MyAccount login system. But what exactly does it offer? As a CFS customer, you can register your billing and shipping address details to recall them all with only your email address and a password. You’ll be able to see your order history as well as a list of all the items you’ve ordered in the past. Perhaps the best feature of all: you can place a new order by just checking off the items from your list – making reorders of binding supplies, covers, etc. super quick! Plus there are no more codes to remember – once you are logged in, you’ll see your Frequent Buyer discounted pricing across the whole site as well as in your cart. If you have a tax exempt or resale status with us, you’ll also see the the the tax removed from your orders. Like most robust ecommerce sites: if you can’t remember your password we have a ‘forgot my password‘ feature that automatically helps you get back into your account within a few seconds. Click the image above and watch the video below to see My Account in action including the Order History and Quick Reorder screens. If you have registered and can’t seem to access your account or just need all around help with it, we are here to help, just contact us. Do you have a suggestion on how we can make our website work better for you? Please let us know in the comments below, we love to hear suggestions. Where’s My Stuff? Enhanced Order Tracking Now Live! I’ll admit it, I order plenty of stuff online from ecommerce websites, eBay, Amazon and plenty of others and I enjoy the convenience that online shopping offers. It seems like (in most cases) I come away with the same question – no matter whom I order from: “When will I get my order?” Eventually I may get an email that states something about an expected ship date, later I may see another email that gives me my tracking number. Ideally, I want to be able to check up on my order and track it any time that I want to. At CFS, we want to offer the same order details that we like to see when we’re shopping for orders. So, we’re proud to announce that we have added a new, enhanced Order Status feature on our website! You can check the complete details of your order and track your items online. It’s just as simple as typing in your zip code and the last 5 digits of your order number. This is just one of the many new features that we’re adding this month – all focused on making cfsbinds.com quicker and easier to use for you when shopping for binding supplies. Do you have a feature in mind that we could add to our website – something that makes it easier and quicker for you? Let us know in the comments below, we’d love to hear from you! Have you ever wished that you could just have someone show you how to do something rather than just reading about it? Personally, I know that I can learn something much more efficiently if I see it happen rather than reading a series of procedures from a manual or a webpage. YouTube videos have been a saving grace for me and have practically become my first go to for researching. That was the inspiration behind our CFS Resource Center that we display on many product pages across the CFS Binding Supplies website. In the Resource Center we show you how it’s done. 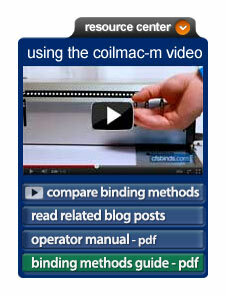 You can watch several of our tutorial help videos on how to operate and setup binding machines. Are you new to a specific type of binding supply? No problem, we give you access to overview videos that show you how each binding method is performed. One of the things I like to do when considering a new equipment or software purchase is to download and browse the operator manual to get a sense of what I have to expect. The Resource Center has those too for several machines. For binding supplies, we have given you one click access to capacity charts that show you the maximum number of pages and the largest thickness for each size. And to keep in the spirit of showing you: watch a video walk-through of the CFS Resource Center. Can you think of more help that you’d like to see on the site? Or perhaps any other ways that we can help you online or offline? Let us know in the comments below – we’d love to hear from you. Question Corner: Can Padding Compound Be Ordered In Any Season, As I See It Can Freeze? Q: Can padding compound be ordered in any season, as I see it can freeze? A: Yes, it can be ordered at anytime of the year. 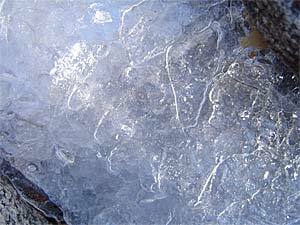 While the padding compound is a liquid-based material, it will usually only freeze when it goes up in an airplane for expedited/overnight deliveries where it would usually be exposed to teperatures well below freezing. Ground service deliveries via FedEx or UPS are almost always safe for transporting padding glues without any freezing occurrences. Most of the major shippers’ depots and transport vehicles typically have some sort of temperature regulation and the packaging helps to keep it from freezing over at ground level altitudes. So pad away and order all the padding compound you need, CFS won’t leave your binding projects out in the cold. Do you have a question regarding shipping bindery supplies? Let us know in the comments below. CFS recently moved locations and we had the chance to decorate our own office, so here’s my chance to show off one of my new floating bookshelves. This one holds some of the most valuable business reading we have ever encountered at CFS. Yes, I did an awful job applying the stone wall photo mural. I recently read the following statement: “Customer service is the new marketing.” Thanks to immediate tools and information at consumers’ fingertips and social media platforms, we can no longer effectively push our marketing messages down the throats of customers. The entire customer experience is the great equalizer that will separate the good from the bad – not marketing budgets. Customer service is the most hands on part of the customer experience that you and your employees have the most control over. While being good at responding to your customers’ needs is a necessity, without creating awesome customer service moments that exceed their expectations, your service will most likely get little notice. The picture to the right is just a handful of books that we have read and taken to heart as part of our company culture that has fostered a customer-centric attitude at CFS to allow us to offer what we have called unparalleled customer service. There are a couple of my most recommended books missing though: The Thank You Economy by Gary Vaynerchuk, UnMarketing by Scott Stratten (both loaned out to friends) and The Book Of Business Awesome by Scott Stratten (on my Kindle). 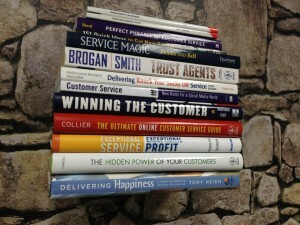 Got any great business books that have changed the way you think about your customers? Share them in the comments below.